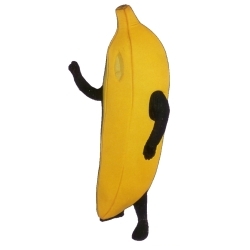 This banana mascot is a full body foam mascot costume. This is a sale item. Manufactured from only the finest fabrics. Fully lined and padded where needed to give a sculptured effect. Comfortable to wear and easy to maintain. the black unitard pictured is not included but is available for purchase. Due to the size of this item a shipping fee of $75.00 will apply, please call for more information.